NASHVILLE, Tenn. (AP) -- Financial services firm UBS AG on Wednesday announced it will consolidate back office functions in Nashville, creating 1,000 jobs in the city over the next five years. Kathleen Lynch, the chief operating officer of UBS Group Americas and Wealth Management Americas, said the Swiss bank is investing more than $36 million in the city, where it already employs more than 200 people. "The global strategy for UBS is to create regional hubs around the world," she said. "We have hubs in India, China, Poland and Nashville will be the Americas hub." Tennessee Gov. Bill Haslam and Mayor Karl Dean lauded the decision to choose Nashville for the center. Both state and local incentives played a role in landing the investment, but both said final details are still being worked out. 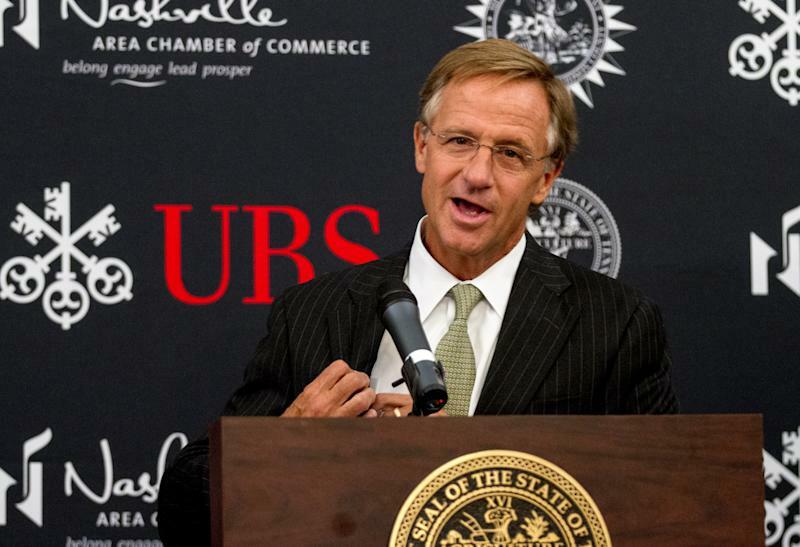 "It speaks volumes about Tennessee and about Nashville when a company like UBS chooses to make this kind of investment here," Haslam said. "We're thrilled there's a thousand new jobs in Tennessee." Some of the jobs could be filled by current employees in other UBS locations. Dean said the decision is a testament to Nashville's welcoming nature. "You'll find us to be inviting to newcomers in a city that embraces diversity, making it so that any company that moves here from anywhere in the country or anywhere in the world feels welcome and wanted," he said. Lynch declined to say what average the salaries for the new Nashville jobs will be, adding that compensation will depend which duties are performed. The center will include positions specializing in information technology, legal compliance and finance, among others. "We will be taking advantage of natural attrition that may be happening in other locations within the Americas region," Lynch told reporters after the announcement at the state Capitol. "What we will be doing is looking at the employee base, and it is part of our strategic agenda where we can be more efficient and effective in how we service our businesses," she said. UBS has struggled to return to profitability and to restore its reputation after heavy subprime mortgage losses after the real estate bubble burst in 2007, an embarrassing U.S. tax evasion case that blew a hole in Switzerland's vaunted tradition of banking secrecy and a $2 billion rogue trading scandal and a wave of restructuring. It said last month the U.S. government had agreed in principle to settle a lawsuit against UBS that seeks to recoup more than $900 million in losses from mortgage-backed securities. The bank also reported that net profit jumped 62 percent in the second quarter of the year, but was still way down from the comparable period in 2012.